Today’s Photo Of The Day is taken from above in the port of Gothenburg, Sweden. You see a sniper armed with a PSG-90 (Accuracy International Arctic Warfare in .308 Win), as used by the Swedish Armed Forces. The optics is most likely a Schmidt & Bender 3-12 PMII and a Spuhr mount. 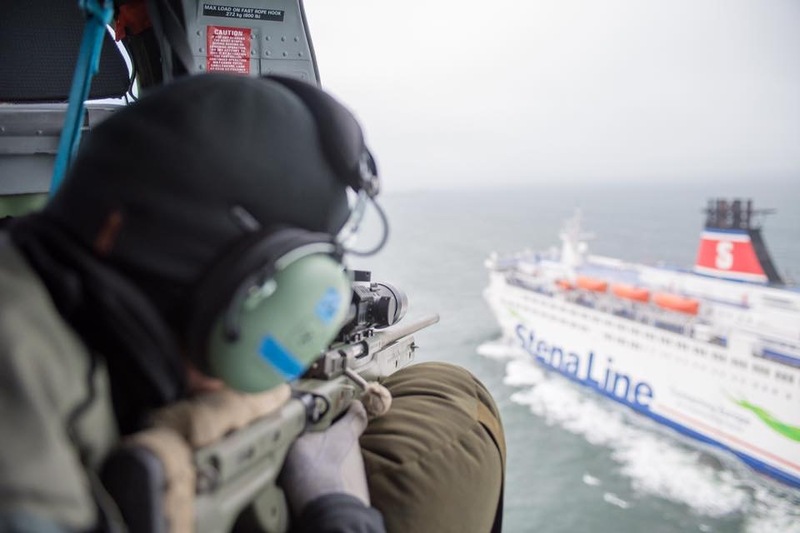 The sniper is a member of an amphibious unit during a recent exercise, showing how the sea and supplies can be protected from the air, on the surface, and beneath the surface. Not that a Stena Line Cruiser is likely to pose a threat, but there may be people on it that do. Photo: Jonas Olsson – Swedish Armed Forces.